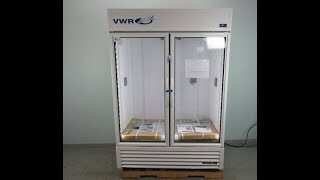 The VWR Chromatography Refrigerator provides you a spacious, brightly lit dependable storage solution with easy to use digital control. This energy efficient, thermal glass door chromatography refrigerator maintains an average temperature between 3-5°C (37–41°F) that can be set from the up top digital display. The brightly lit interior of the VWR Chromatography Refrigerator is painted white for great contrast with adjustable shelving, and thermal insulated glass doors with a magnetic close. This double door chromatography fridge features an innovative all-natural hydrocarbon R290 refrigerant that has zero ozone depletion potential. The bottom mounted condenser partnered with the extra-large evaporator coil, is positioned for easy maintenance and creates a non-stoop lower shelf. This VWR Chromatography Refrigeration 10791-624 is a brand new scratch & dent model tested by our service team as part of QC process. Chromatography Refrigerator has a clean bill of health. All of our lab equipment comes backed with our standard warranty. Should you have any questionst, please don't hesitate to contact us.